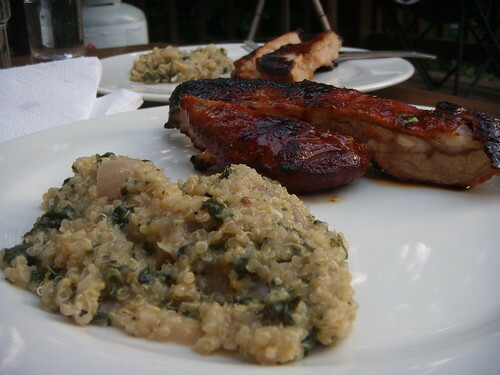 totally broke: bbq ribs and quinoa-spinach mash, originally uploaded by aarn! +21st July, 2008+. found some ribs in the freezer from the last rib meal, bbq-ed them with some molasses, vinegar, oil, and ketchup. had a bag of some old spinach, chopped that up and added it to some quinoa, with garlic, and onions, and some of that sherry vinegar, bay leaf, and probably some other stuff, turned into some righteous slop, but tasted good.